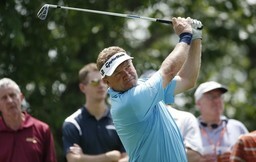 GRAND BLANC, Mich. (AP) Paul Broadhurst won The Ally Challenge on Sunday for his PGA Tour Champions-leading third victory of the season, closing with a birdie to beat Brandt Jobe by two strokes in tour golf's return to Warwick Hills. Fighting a back injury, Broadhurst rebounded from a bogey on the par-3 11th with birdies on the par-4 12th and par-5 13th and made a 15-foot birdie putt on the par-4 18th. "Pretty special," Broadhurst said. "I was seriously wondering whether I would play this week. Back home last week, and pulled a muscle in my back. The physio has done a great job out here this week to get me fit." The 53-year-old Englishman finished at 15-under 201 on the tree-lined layout that was the longtime home of the PGA Tour's Buick Open. "At times it was really scrappy," Broadhurst said. "My game wasn't totally in the groove. It was in spells. ... And the rhythm was getting quicker and quicker. But that goes with the pressure of leading the tournament, I'm sure." Jobe birdied five of the first six holes on the back nine in a 67. He's winless on the 50-and-over tour. "It's frustrating because you only get so many chances, right?" Jobe said. "I had a good chance today, especially the way I played the back nine. Gosh, I mean, 18 I've got L-wedge in, I hit it 15 feet on 17. So every hole I had a great chance on the back nine, that's all you can ask for. I just didn't get it done, which is frustrating." Tom Lehman bogeyed the 18th for a 70 to drop into a tie for third with Mark O'Meara (69) at 13 under. Broadhurst won for the second time this year in Michigan, following his Senior PGA victory at Benton Harbor in May with his fifth senior title. He also teamed with Kirk Triplett for a playoff victory over Lehman and Bernhard Langer in April in the Legends of Golf. Scott McCarron, tied for the second-round lead with Tom Lehman and Jeff Maggert, had a 77 to tie for 33rd at 5 under. The winner two weeks ago in Canada, McCarron dropped four strokes on the final two holes on the front nine, making a bogey on the par-3 eighth and a triple bogey on the par-4 ninth. Maggert shot a 72 to tie for eighth at 10 under.